We searched Pubmed for peer-reviewed articles reporting on the association between dietary patterns and Alzheimer’s disease (AD) incidence in cohort or nested case-control studies. 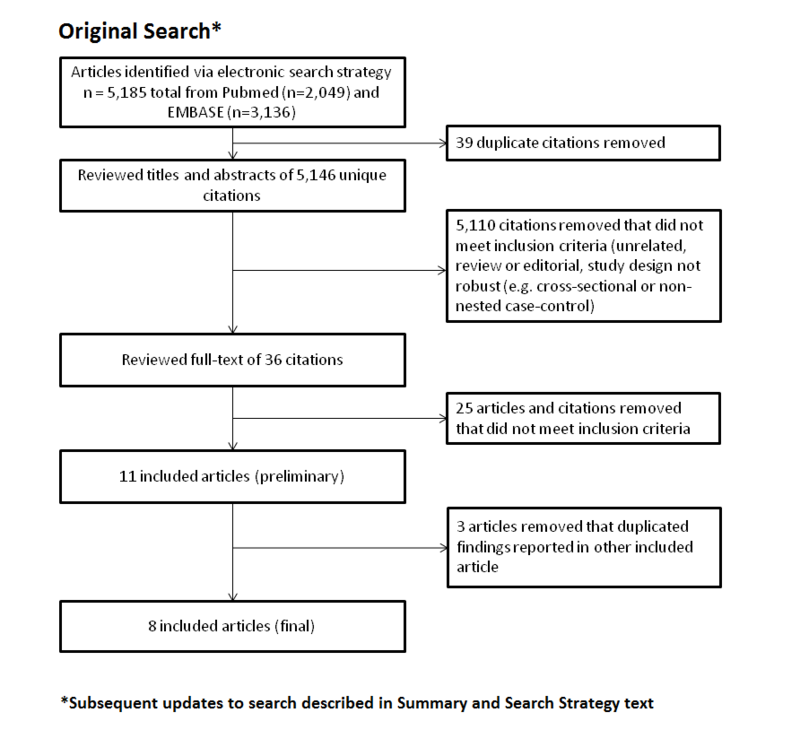 The search returned 5,146 unique citations that, after title and abstract review against our inclusion criteria, were narrowed down to 36 citations for full-text review (all published in English). Of these, 11 fully met criteria for inclusion in our summary tables. We additionally excluded 3 articles that otherwise met our inclusion criteria, but duplicated an analysis from a cohort that contributed data to another included article. We reviewed these duplicate articles on a case-by-case basis, and selected the most informative article based on sample size, follow-up time, exposure assessment or modeling, and appropriateness of analytic methods. Please see our methods section for more detail on our general systematic review methods. We ran an update of the search in Pubmed covering articles published between June 23, 2014 and November 28, 2016, which returned 1150 new citations. We excluded 1142 citations that did not meet our inclusion criteria (e.g. topic not appropriate, review or editorial, animal studies). Six studies were excluded after full text review because they did not meet inclusion criteria. 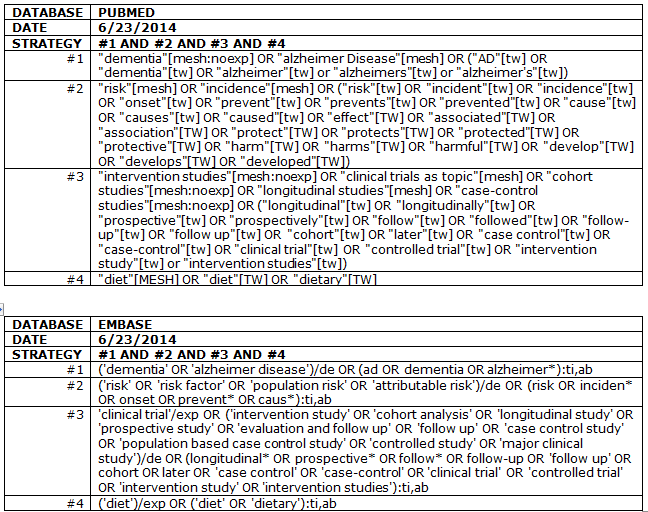 Two articles were added to our Alzrisk tables from this updated search. Some cohort studies produced multiple articles reporting on the association between dietary patterns and risk for Alzheimer’s disease. To avoid presenting duplicate results, we reviewed such articles on a case-by-case basis and selected the most informative article(s) based on sample size, follow-up time, exposure assessment or modeling, and appropriateness of analytic methods. We included main results from Scarmeas 2006 (Ann Neurol) and Gu 2010 (Arch Neurol). Each study used different methods to quantify adherence to a healthy dietary pattern (Mediterranean diet score and reduced rank regression). Scarmeas 2006 (Arch Neurol), Scarmeas 2009, and Gu 2010 (J Alzheimers Dis) used the same methods to quantify adherence to a healthy dietary pattern but reported findings in a subset of the population. Scarmeas N, Stern Y, Tang MX, Mayeux R, Luchsinger JA. Mediterranean diet and risk for Alzheimer's disease. Ann Neurol. 2006 Jun;59(6):912-21. Scarmeas N, Stern Y, Mayeux R, Luchsinger JA. Mediterranean diet, Alzheimer disease, and vascular mediation. Arch Neurol. 2006 Dec;63(12):1709-17. Epub 2006 Oct 9. Scarmeas N, Luchsinger JA, Schupf N, Brickman AM, Cosentino S, Tang MX, Stern Y. Physical activity, diet, and risk of Alzheimer disease. JAMA. 2009 Aug 12;302(6):627-37. Gu Y, Luchsinger JA, Stern Y, Scarmeas N. Mediterranean diet, inflammatory and metabolic biomarkers, and risk of Alzheimer's disease. J Alzheimers Dis. 2010;22(2):483-92. Gu Y, Nieves JW, Stern Y, Luchsinger JA, Scarmeas N. Food combination and Alzheimer disease risk: a protective diet. Arch Neurol. 2010 Jun;67(6):699-706. Epub 2010 Apr 12.